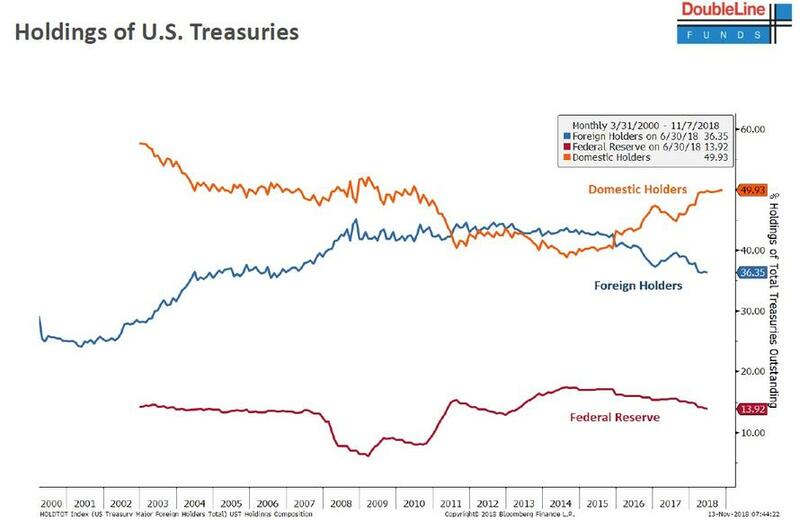 Earlier this week, DoubleLine's Jeff Gundlach held his latest webcast with investors in which he warned that as a result of rising hedging costs, US Treasury bonds have become increasingly unattractive to foreign buyers. 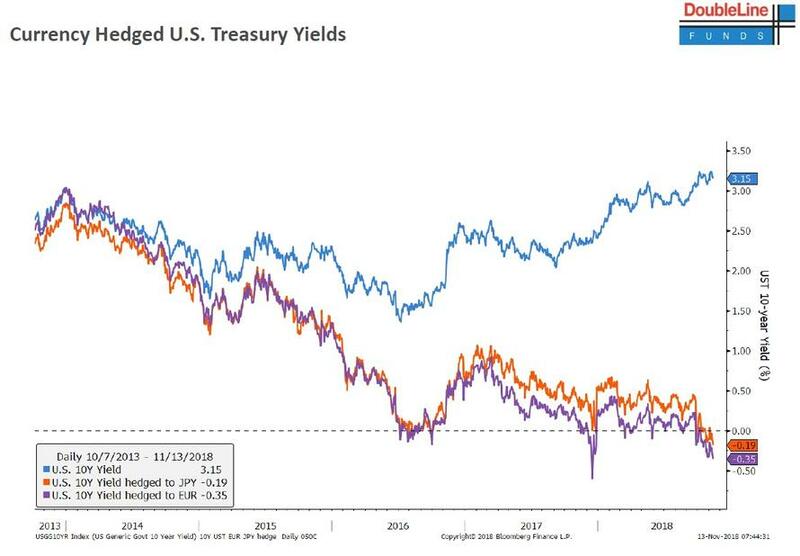 This can be seen in the chart below which shows the yield on the 10Y US TSY unhedged, and also hedged into Yen and Euros. In the latter two cases, the yield went from over 3%, to negative as a result of the gaping rate differential between the Fed and ECB or BOJ. Which brings us to today's latest monthly TIC data which showed that, as Gundlach would expect, the holdings of the two largest foreign US creditors, China and Japan, declined to multi year low. 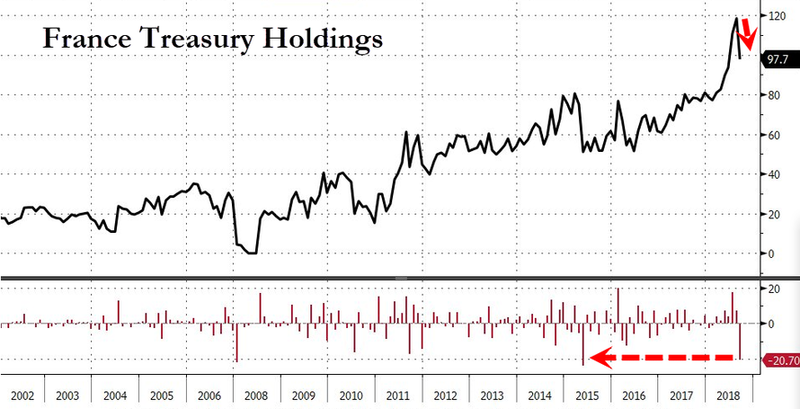 Chinese holdings of U.S. Treasuries declined for a fourth month to $1.151 trillion in September, from $1.165 trillion in August, a $14 billion decline. 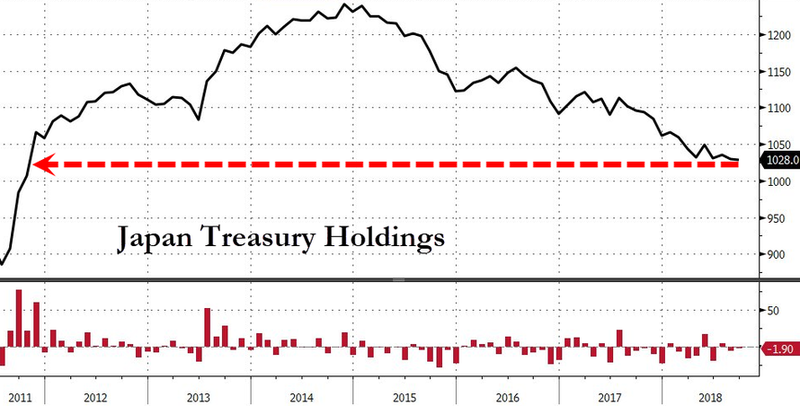 Despite the drop, China remained the biggest foreign creditor to the U.S., followed by Japan whose Treasury holdings also dropped by $2 billion to $1.028 trillion, the lowest since 2011. 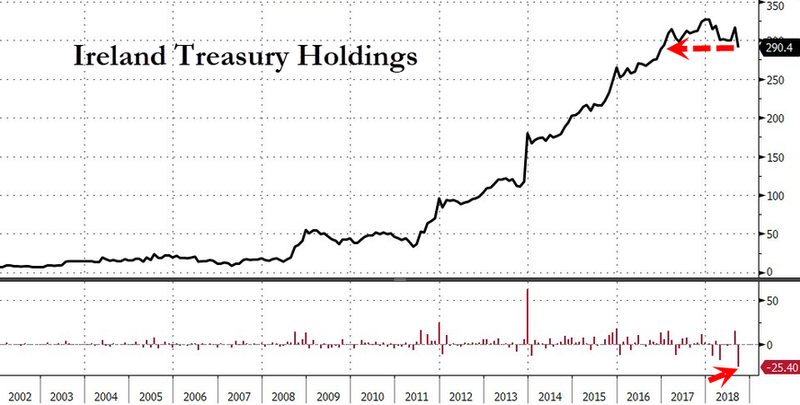 Investors have been searching for clues whether China is dumping its vast holding of U.S. Treasuries to retaliate against U.S. tariffs, though Beijing has given no indication it’s doing so; meanwhile while the TIC data is relatively accurate, it tends to be revised rather materially which is why it is certainly possible that China's real holdings, when adjusted for valuation and currency changes, are far lower. Of course, instead of selling Treasurys, China may have decided to hold on to its reserves and allow the yuan to depreciate against the USD, but not too much: so far 7.00 has emerged as a "red line" for the PBOC. The Chinese currency has already depreciated more than 4 percent against the dollar in the past year amid signs of an economic slowdown and capital outflows. In September, China’s foreign-exchange reserves stockpile fell by $22 billion to touch the lowest level since July 2017, however much of that number was due to valuation adjustments. 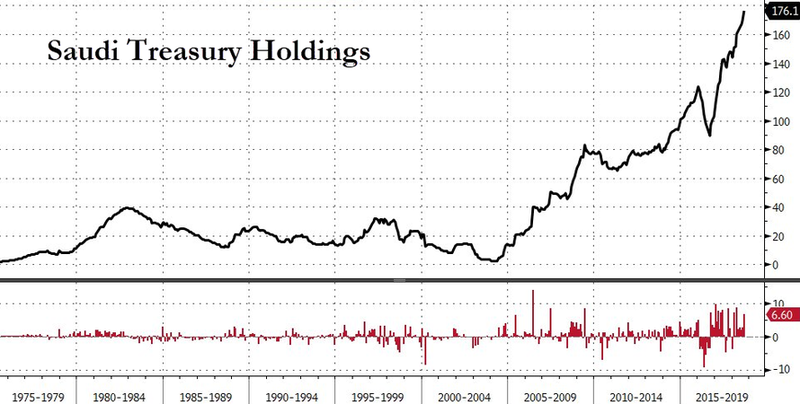 ... and Ireland, which sold over $25BN Treasuries in September, bringing the total to $290BN. Not everyone was a seller: the infamous Belgium, host of Euroclear, added $10 billion to $164.7BN, likely working on behalf of some unknown foreign entity, while Saudi Arabia added another $6.6BN, bringing its total to a record $176.1BN, perhaps in hopes of showing Trump just what a good friend of the US it is. 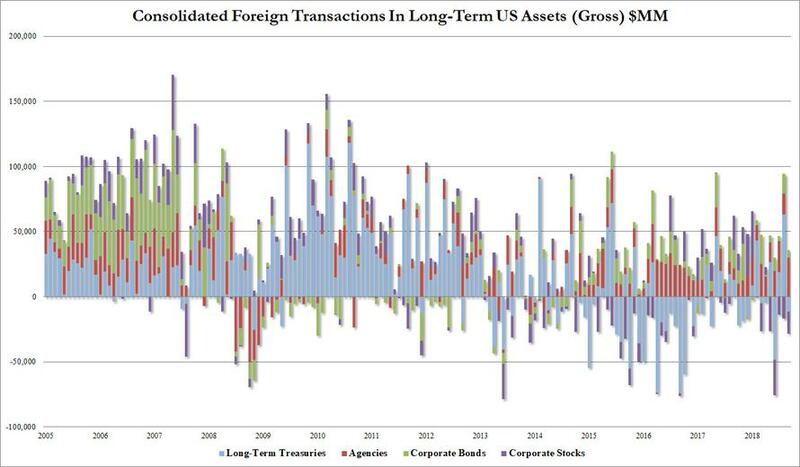 Finally, away from US Treasuries, and looking at total flows, foreigners added a total of $7.5BN in long-term US securities, led by nearly $30BN in Agencies. 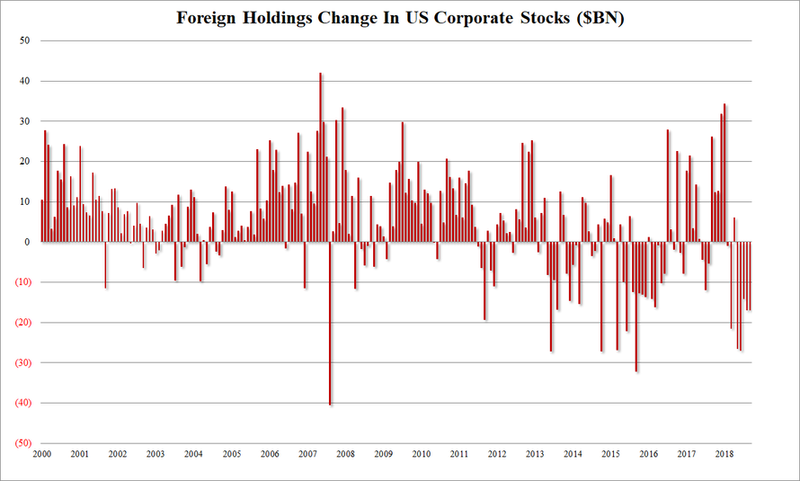 What was perhaps more notable is that in September, foreigners sold another $16.9BN in US stocks, the 5th consecutive month of selling, matching a record long stretch of foreign sales of US equities, and one during which official and private foreign investors sold a total of $102 billion over the past 5 months, a record high. The bottom line: Trump told the world he doesn't need its generosity to either fund the US deficit or prop up stocks, and according to recent data, the world has taken up Trump on his dare, and has been actively liquidating US securities.